Enhance the volume of your hair and improve resilience with Kerastase Age Premium Bain Substantif. Transforming mature hair, this nourishing hair bath revitalises, thickens and leaves your hair feeling beautifully light to the touch. 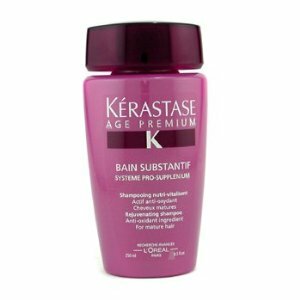 Kerastase Age Premium Bain Substantif combats the signs of mature hair ageing by protecting and supplementing your hair and hydrating your scalp. Using Systeme Pro-Supplenium technology, calcium derivative offers the support of a mineral essential vitamin F derivative provides much needed energy to the root and substance to the fibre whilst ceramide helps to repair the cuticle. With vitamin E acting as a powerful anti-oxidant and a UV filter to protect against harmful sun rays, your hair is left thoroughly revitalised.